High-availability increases the likelihood that your app stays up in the event of unforeseen container, machine, or availability zone failures. We recommend high-availability for all business critical and production apps. Galaxy supports high-availability by default. Just run three or more Standard containers to enable it for your app. You’ll see “HA” in a golden box next to any apps where high-availability is enabled. 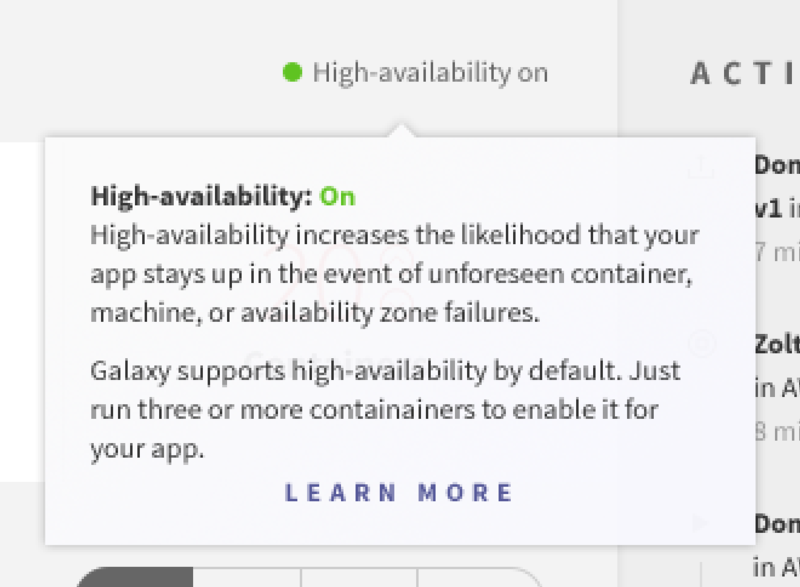 For deployments with three or more Standard containers, Galaxy will distribute an app’s containers to a different availability zones in the same region. Dividing infrastructure across multiple data centers ensures that high-availability apps are fault tolerant.